It’s January, which means the first European coin-op amusement tradeshow of the year is coming up: EAG Expo. The event is held in the Excel building in the London Docklands. It’s a three-day event, this year running from January 16 to 18. 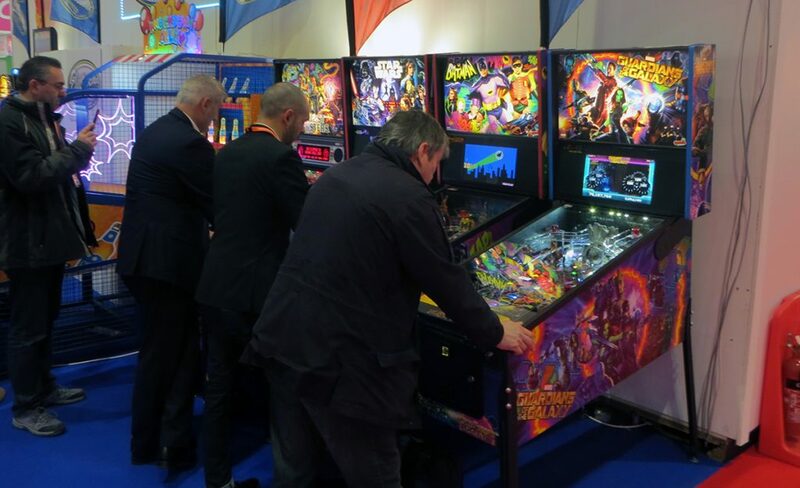 Contrary to previous years the 2018 edition covered more floor space, more exhibitors and the number of pinball machines presented at the show was also up this year. Let’s see who were there and what was on display. 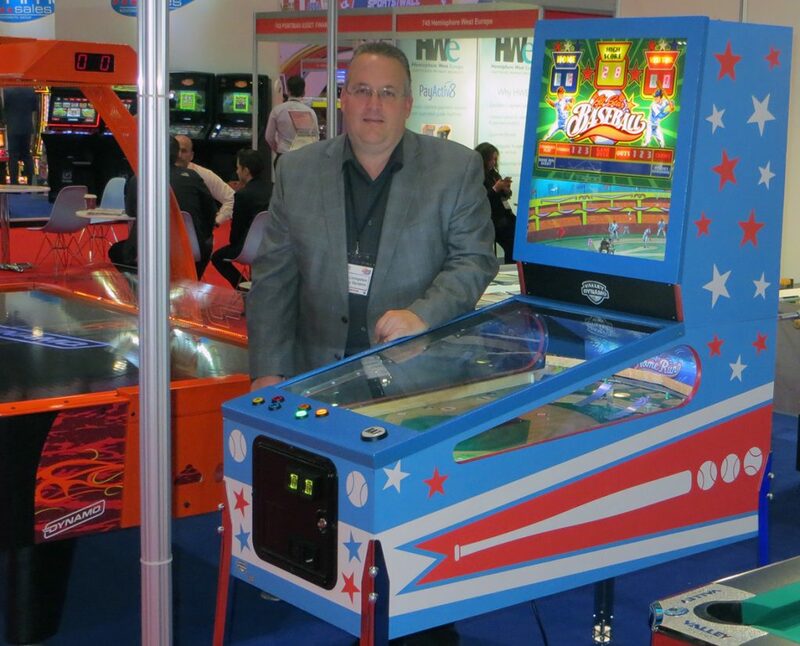 Stern Pinball usually has a few games set up in the stand of Electrocoin, their UK distributor. This year was no exception to that, and the company had four games on display: Ghostbusters, Star Wars, Batman and Guardian of the Galaxy. Besides having four games this year, one more than we’ve seen being displayed the past number of years, Stern also showed up with a heavy delegation of management. On the opening day of the show, Tuesday January 16th, the company was represented by the inevitable Gary Stern (President), Dave Peterson (head of the investor group that owns Stern Pinball), John Buscaglia (Chief Revenue Officer), George Gomez (Vice President of Game Design) and Jim Belt (Director of Distributor Sales). Unfortunately, the Guardians of the Galaxy game was dealing with a technical issue on the opening day of the show. A spare part wasn’t instantly available and had to be collected from the Electrocoin offices, resulting in that game – while being turned on – wasn’tnt playable for most of the day. It wasn’t until late in the afternoon before the game was fixed. On the second day of the show, none of Stern’s delegation appeared to be at the show floor in the morning. In previous years Stern used to have a special invite-only meeting with their European distributors about how the company is doing and what they expect to be coming out with this year, and – while unconfirmed – it seemed like a similar meeting was held again this year. The size of the Stern’s delegation at the show may have had to do with that as well. 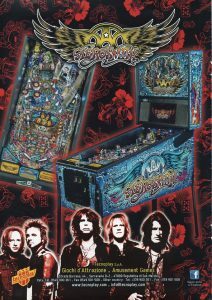 Update: An anonymous source informed us that Stern Pinball announced the availability of the following games for January 2018: Guardians of the Galaxy Premium and LE, Star Wars Pro and Premium, Aerosmith Premium, Batman Premium, Ghostbusters Premium and Wrestlemania Pro. For the rest of Quarter 1 of 2018 the following games should be available: Guardians of the Galaxy Pro and Premium, AC/DC Luci Premium Vault Edition, Star Wars Pro and Premium, Aerosmith Pro, Batman Premium, Ghostbusters Pro and Premium, Metallica Pro. Stern’s next new title is likely to be announced in April, which according to rumors, should be Keith Elwin’s first game with artwork by ZombieYeti. As far as I could tell as a visitor three of the four games held their own during the show. Guardians, however, seemed to have an issue on Wednesday as well. The game has a single drop target in front of the orb-toy in the center of the playfield. Players can temporarily lock a ball behind that drop target. The problem at the show was that the game can’t detect whether there is a ball behind the drop target. What happened repeatedly over the course of the day was that a ball would end up behind the drop target, but the drop target would not drop down to release it. Instead, the game went into ball search mode. After a minute or two it would simply go into the End of ball sequence and fire a new ball into the shooter lane for the next player. This took away a bit of the fun of playing the game. Note that this may be something that is easy to fix that should typically not be an issue, but as I’m reporting on what went on at the show, I can’t ignore it either. Aside from that – with this being the first time for me to be able to play the game – I was pleasantly surprised with the game. Running on code 0.85 the game was fun to play. After being absent for a few years, Pinball Heaven was back at the show with a stand with more games present than ever before. 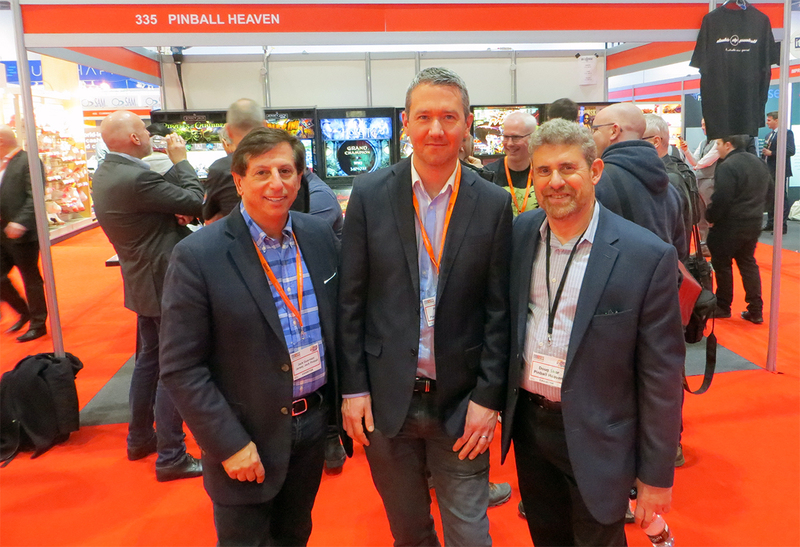 Pinball Heaven is the UK distributor for Jersey Jack Pinball and Chicago Gaming. To represent these companies Jack Guarnieri (JJP) and Doug Skor (Chicago Gaming) were at the show as well. JJP had three games at the stand: The Hobbit, Dialed In and the upcoming Pirates of the Caribbean. Chicago Gaming was represented with their remakes of Medieval Madness and Attack from Mars. Pirates of the Caribbean seemed to be running on game code that was further developed than when it was shown at Pinball Expo in October 2017. The LCD in the backbox was displaying random tips to the player after the End of ball sequence. These would tell the player something like, “To play longer, don’t drain the ball,” or to use the action button on the lockbar to collect gold during gameplay. As I only played a few short games, I couldn’t discover any major additions to the rules or gameplay. Dutch Pinball was also present with The Big Lebowski at the Pinball Heaven stand, completing the total number of available games to six. The game had a note on it that the game should be available after the summer of 2018. On the Tuesday of the show, some of the playfield lights on The Big Lebowski didn’t work. That problem was solved quickly after the show closed on Tuesday and the game played fine on Wednesday. 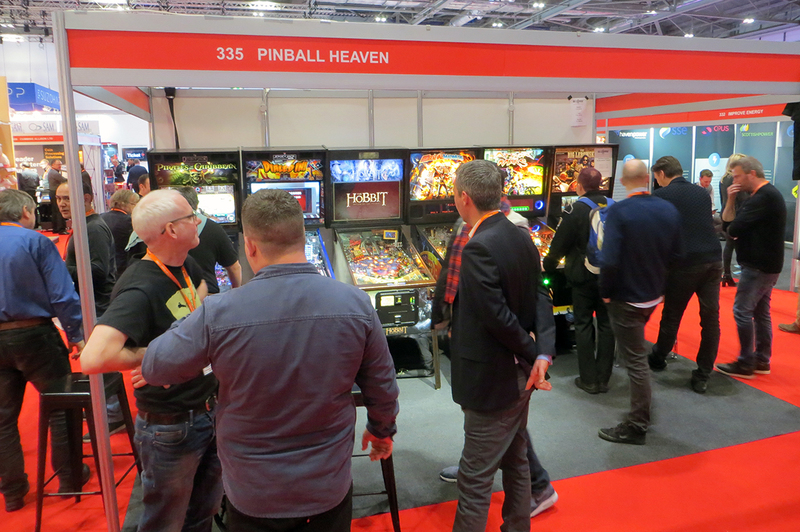 While the presence of Dutch Pinball at the Pinball Heaven led to some people assuming that Pinball Heaven will be distributing their game in the UK, that may be a bit premature to assume. Regardless it’s a good thing to see Dutch Pinball being present at the show. Heighway Pinball was present with a black-trimmed Alien. Contrary to previous years the company didn’t have a stand of their own. Instead, the game was set up in the stand of Home Leisure Direct, one of the major pinball stores in the UK that also sell other gaming equipment. Representatives of the company said they were very happy with how the game had further developed under the new management at Heighway Pinball. Unfortunately, I didn’t spot any management representatives of Heighway Pinball on the Tuesday or Wednesday morning of the show, but I was told someone should be there on Thursday. To my pleasant surprise, Valley Dynamo was also present at the show with a stand of their own in which they displayed their All-Star Baseball game. This is a pitch and bat game, designed by pinball designer Dennis Nordman and his team. The game is available in two different versions; the other being Zombie League All-Stars, but for this show, the company figured the classic Baseball-themed game would make more sense. The game features a running man-unit in the backbox. Unfortunately, the running man-unit appeared not to be running the second day of the show. Aside from that, with Europe not being very Baseball-minded, it was a pleasant surprise to see that Valley Dynamo brought the game along with their other products. Was this all? As far as exhibiting companies goes yes, but there was more. At these trade shows, a variety of international magazines is presenting themselves as well, and promotional copies of the latest issues are being distributed for free. As editor of Pinball Magazine, I’m usually taking a copy of each to go over and see if there is anything interesting pinball related content in them. This year I found an Italian full-page ad from Tecnoplay for Stern’s Aerosmith in a special edition of Play Machine Europe. The artwork and layout of this ad is different than the flyers that Stern put out, so for that reason I find them interesting. In the Asian publications often ads can be found in which pinball styled bingo/gambling games are advertised. Hot Games Annual is an Asian publication that featured several adds for 3D pinball machines as well. These are usually the virtual type of pinball games that can be played in a pinball shaped cabinet, but with a large LCD instead of a physical playfield. 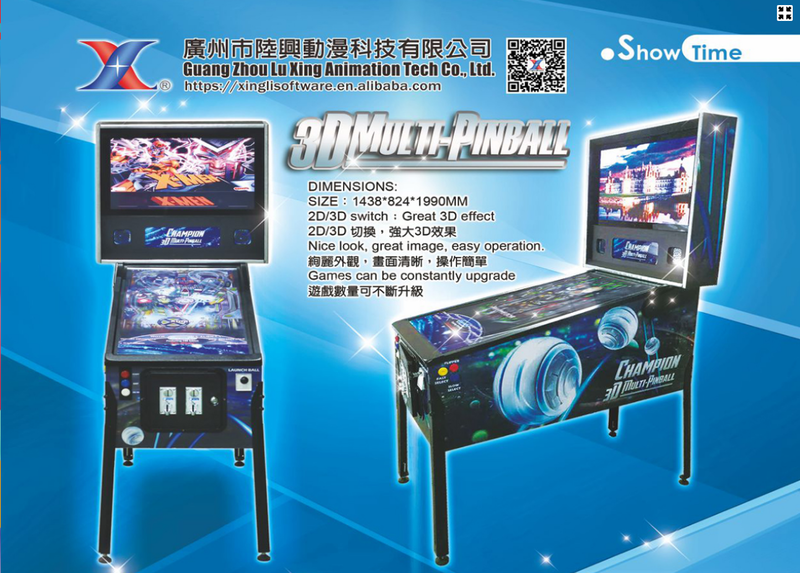 One add, from Guang Zhou Lu Xing Animation Tech Co Ltd, caught my attention as it showed a 3D Multi-Pinball with a translite image of Stern’s X-Men and a playfield that appears to be a digital version of the same game. Stern is known to work with The Pinball Arcade on their virtual emulations of their tables, but I haven’t seen any news come from Stern that they are in some way involved in this product as well. Else I’m sure they would have communicated about it. I will check with Stern, but for now, I’m just observing. Last, but not least, I found an ad in another Asian publication from Wee Chin Electronic Machinery Inc, a cabinet company. This ad included what appears to be a physical head-to-head pinball machine that reminds of Williams’ Joust from 1983. 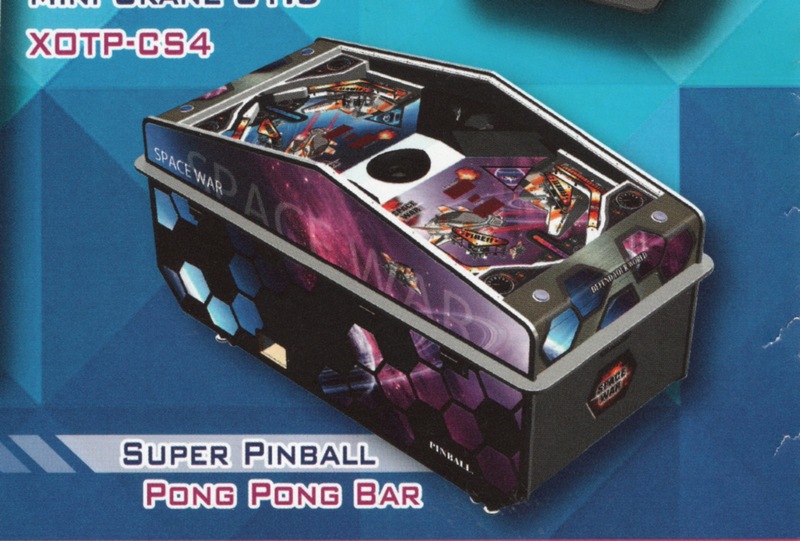 While the cabinet says Space War, the game is mentioned as Super Pinball Pong Pong Bar. In the ad, the image of the game is a little smaller than the size of a business card, but scanning the ad made it possible to enlarge the game, to see more detail. As far as I can see this appears to be a 3D render and not a photo of an existing game. Based on the angle the game is pictured in, and the items on the playfields, it does appear to portray a physical pinball machine. However, when zooming in it appears the flipper don’t have any rubbers on them. Each playfield only has a set of flippers and two slingshots on it. There also seem to be two sets of numeric red displays in the center of each playfield. As this strongly appears to be a rendered image and not a photo of a game, it remains to be seen whether the game exists in physical form. I have contacted the manufacturer for more info. Brilliant music a lighting effects. The company will be present at Amusement Expo in Las Vegas at the end of February (Booth 605) and they plan to demonstrate the game there as well. As I left in the afternoon of the second day of the show, I didn’t attend the traditional exhibitor party on Wednesday evening, but that’s usually more of a social gathering with no news reveals. So this concludes all I can report about the 2018 edition EAG Expo. I did talk to all pinball managers at the show, but as is unclear what I was told off the record and what was on the record, I’ll verify that first and what can be revealed will be added to the above mentioned Who’s Working On What?-page. In conclusion, I’m happy to see the show appears to be growing, occupying more space in the hall and more exhibitors presenting at the show. 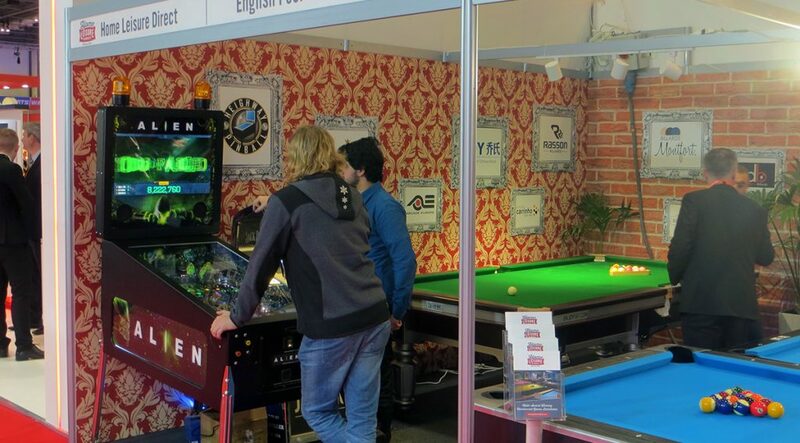 With 11 pinball machines and a pitch & bat game present pinball certainly is more present at the show. Hopefully, this will be a trend for future years.